Defense rules among the Pac-12's top 2016 draft prospects, including Oregon star DeForest Buckner and a USC safety who has been compared to Troy Polamalu. The start of the 2015 draft was kind to the Pac-12, which produced the second and sixth picks (Marcus Mariota and Leonard Williams, respectively) and had a total of seven players taken in the top 20 selections. 1. DeForest Buckner, DE, Oregon: Former Duck Arik Armstead came off the board at No. 17 in this year's draft, to San Francisco. Buckner's better, or at least he was at the end of last season. Armstead offers higher upside, but Bucker has been a more well-rounded player for the Ducks. He almost joined Armstead in the 2015 draft class, too. Buckner required an arthroscopic procedure on his knee following the 2014 campaign and had to sit out spring ball because of it—that situation could have played a role in his decision to keep the NFL waiting. The league's loss is Oregon's gain because the 6'7", 290-Buckner, a DE in the Ducks' 3–4 scheme, could be among the most dominant defenders in all of college football. He produced 12.5 tackles for loss and 4.0 sacks last season, numbers which he should be able to challenge again in 2015. The sack total, in particular, could rise. Buckner has the size to outmuscle blockers, coupled with a solid set of counter moves. If this year goes as planned, Buckner will be a top-10 overall prospect. ​2. Su'a Cravens, S/LB, USC: Former USC star and NFL Hall of Famer Ronnie Lott invoked Troy Polamalu's name when praising Cravens after the spring game. Obviously, that sets a towering bar for the Trojans' junior safety—one he might be able to reach, at least as a college player. Polamalu was a consensus All-America in 2002, his final season before jumping to the NFL. Cravens was a third-teamer last year and is on the watch lists of numerous awards ahead of 2015. His role as a hybrid safety/linebacker for the Trojans allows Cravens to provide a Polamalu-like attacking presence in the box. Last season alone, Cravens notched 17.0 tackles for loss and 5.0 sacks, plus three interceptions, in case you're worried about his coverage game. NFL teams have fawned all over players of a similar cut in recent drafts. A linebacker with the skills to handle slot coverage, Jack finished last season with 87 tackles and 8.0 tackles for loss. He's also stepped over to the other side of the ball in his two UCLA seasons, scoring 10 rushing touchdowns and gaining 380 yards on 66 carries. The comparisons to 2015 first-round draft pick and two-way Washington star Shaq Thompson are easy to make, especially since there may be similar concerns about Jack's size (6'1", 232 pounds) as there were about Thompson's (6'0", 228). In the end, there was no denying that Thompson, while undersized, had the instincts and athleticism to be an impact player in the NFL. Jack should receive the same benefit of the doubt. ​4. Max Tuerk, C, USC: Tuerk already has starts under his belt at left tackle, left guard, right tackle and center. He thrived in the middle of USC's line last season, though coach Steve Sarkisian still at one point considered sliding Tuerk to left tackle in an injury-induced pinch. Competent everywhere and excellent at center is the same formula Florida State's Cam Erving used en route to a round 1 selection this year. Tuerk (6'6", 285 pounds) brings similar plug-and-play capabilities to the table. He has work to do refining his game at his current position—a few more pounds could help—but the footwork that allowed him to play on the edge serves him well inside. 5. Eddie Vanderdoes, DT, UCLA: Central to the success of UCLA's linebackers, and of Jack in particular, is the work Vanderdoes takes on as a 305-pound presence. Time and again last season, he occupied multiple blockers, clearing lanes for Jack to find the football. Vanderdoes finished with 50 tackles and 5.5 tackles for loss of his own. His path to UCLA was a roundabout one. Vanderdoes initially committed to USC, then signed with Notre Dame before appealing for a transfer to the Bruins. The NCAA gave him the go-ahead for the 2013 season, and he wound up starting seven times as a true freshman. There's not a lot of flash here, and certainly not much in the way of statistics, but Vanderdoes plays a vital role. 6. Cody Kessler, QB, USC: What do NFL teams want in a quarterback? If a front office is dead set on a prospect who fits the physical prototype—height, huge arm—or offers true dual-threat abilities, Kessler probably is not the right guy. If, on the other hand, a team wants a quarterback who appears intelligent enough to win the mental aspects of the game and is capable of making all the required throws, the USC signal-caller should be intriguing. Kessler (6'1", 215 pounds) has few traits that will help him stand out at the scouting combine. What he does in-game, though, is noteworthy. Kessler completed 69.7% of his passes last season, with 39 touchdowns and just five interceptions. He has that coveted ability to throw receivers open, anticipating where their breaks will give them space against the coverage. Will that be enough for Kessler to climb into the first round? Maybe not. However, he should find a comfortable landing spot on a team hoping to keep him around for the long haul. 7. Devontae Booker, RB, Utah: Booker did not disappoint in his first post-juco season, rushing for 1,512 yards and catching 43 passes for the Utes. Even off a 335-touch showing, Booker could be in line for even more work this season if Utah's coaches are to be believed. That's great news for scouts hoping to get a longer look at him; not so much for teams shying away from running backs with a lot of miles on the tires. The 5'11", 203-pound plays bigger than he stands—per Rotoworld, his 815 yards after contact topped all Pac-12 backs in 2014. He's shifty with the ball in his hands, wasting little time exploiting holes. Add in his three-down abilities, and Booker has a shot to be among the first backs off the board next April. ​8. Scooby Wright, LB, Arizona: One hundred and sixty three tackles. Think about that. Wright posted 163 tackles in 14 games last season, an average of more than 11 tackles per game. He was handed the Bednarik, Lombardi and Nagurski Awards as a result. Another Pac-12 prospect without an ideal physical build (6'1", 246 pounds), Wright has shown no ill effects when forced to pick through traffic. He takes on blocks and gets downhill as well as any linebacker in the country. 9. Jared Goff, QB, Cal: Oregon newcomer Vernon Adams and a couple of others could crash the party, but the Pac-12 QB debate headed into 2015 centers on Goff vs. Kessler. Goff better fits the mold of the modern NFL quarterback, at 6'4" and with enough mobility to make plays outside the pocket. Can he keep pushing his progression forward as a junior? The lanky quarterback showed improvement in accuracy and in his ability to stretch the field last season, both of which will appeal to NFL teams. His 35–7 touchdown-to-interception ratio was right there with Kessler's numbers, on a team with far less talent. 10. Tyler Johnstone, OT, Oregon: When last we saw Johnstone during Oregon's 2013 season, the 6'6" tackle had the look of a burgeoning star. An ACL injury suffered in that year's Alamo Bowl cost Johnstone all of 2014, so the redshirt senior has work to do reestablishing his draft stock. His build (now listed at 295 pounds, up from 285) and footwork call to mind former teammate Jake Fisher, a 2015 second-round pick of Cincinnati. Johnstone may not be quite as athletic as Fisher, but he can cover a lot of ground moving in all directions. The Ducks are lucky to have him back. Arizona—Reggie Gilbert, DE: The NCAA granted Gilbert a fifth year of eligibility due to a 2011 leg injury, so he has another shot to make a name for himself. Last season, the 6'4", 262-pound end finished with 49 tackles, 5.5 tackles for loss and 3.0 sacks. Gilbert does show some giddy-up turning the corner, but it has to be a more consistent feature. Arizona State—D.J. Foster, RB/WR: Foster (5'11", 205 pounds) is making a move to receiver this season. It won't be too tough of a transition given the 125 receptions he made between 2013 and '14 as a running back. If Foster excels in the slot, his draft stock could skyrocket. What team doesn't want a do-everything weapon on offense? ​California—Daniel Lasco, RB: As a junior last season, Lasco thrived as the Bears' starter en route to 1,471 total yards and 14 touchdowns. He may not stack up to the Ezekiel Elliotts and Devontae Bookers of the world in terms of raw ability, but Lasco would be a useful piece for an NFL team. His pass-catching ability could push him toward a third-down role. Colorado—Nelson Spruce, WR: The 6'1", 195-pound Spruce caught 106 passes and scored 12 times last season. Once the high-profile receivers hear their names called next April, Spruce will be in the mix. He's a reliable pass-catcher with a knack for finding the first-down marker and the goal line. Oregon—Byron Marshall, RB: A running back turned wide receiver with his NFL future likely meshing both roles together. Marshall rushed for 1,000 yards and 14 touchdowns back in 2013, then caught 74 passes for another 1,003 yards last season. Give him the ball in space, and he'll find a way to create. ​Oregon State—Caleb Smith, TE: Though not always his own fault, Smith's stats (47 career catches for 564 yards and five TDs) thus far have left something to be desired. Can NFL teams look past that to see the potential? It's definitely happened before for tight ends with Smith's physical traits. The 6'6", 269-pounder could develop into a movable target for a pro passing attack. Stanford—Kyle Murphy, OT: The heir apparent to 2015 first-rounder Andrus Peat, Murphy will shift from right tackle to the left side this season. At a long 6'7" and 298 pounds, Murphy would seem to possess the skills necessary for a successful transition. UCLA—Jake Brendel, C: Soon to be a four-year starter for the Bruins, Brendel (6'4", 290 pounds) has proven irreplaceable along the O-line—just watch how much UCLA struggled up front without him early last season. Smart, experienced centers usually get a crack at the next level, and Brendel deserves one. 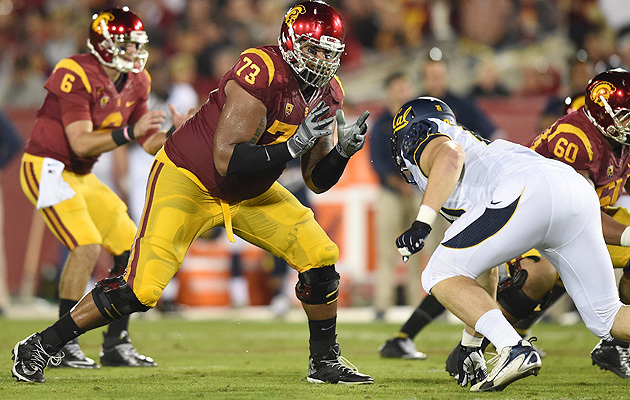 USC—Zach Banner, OT: An absolute behemoth at 6'9" and 360 pounds, Banner's size alone will have NFL teams circling. In fact, Banner (son of former NFL player Lincoln Kennedy) nearly turned pro after his redshirt sophomore year. He's back, which was a smart decision—Banner still needs to improve his technique. It's not easy to keep all that height and weight in line, and Banner can be forced off-balance by quick edge rushers. ​Utah—Travis Wilson, QB: A 6'7" dual-threat quarterback has to catch the NFL's eye a bit, regardless of how up and down his college career may be. Utah actually benched Wilson midway through last season; he responded with some impressive performances late in the year. If he maintains that momentum into 2015, it won't be long before his stock climbs. Washington—Travis Feeney, LB: The best news for Feeney's draft hopes is that Washington now has him at 223 pounds, about 20 pounds heavier than when he made his debut back in 2012. The added weight and his length at 6'4" give him some NFL hope. His first three years have consisted of baby steps. Feeney, a former safety, shows the potential to be an impact linebacker, but he's still working to put all the pieces together. Washington State—Dom Williams, WR: Williams has improved steadily during his Cougars career and he gets to cap it by stepping into Vince Mayle's vacated role as the go-to receiver. Mayle was a fourth-round pick this spring, and Williams could prove to be the better of the two. He's already more advanced in some areas, especially as a route-runner.